Transport yourself to centuries past to a time when the trading along the spice roads led to great wealth and power. As a spice merchant you’ll lead your caravan to exotic markets to sell your valuable spices. Do you have what it takes to play your cards shrewdly, time your trades just right to acquire five point cards first and claim victory as the most renowned spice trader in the Mediterranean? 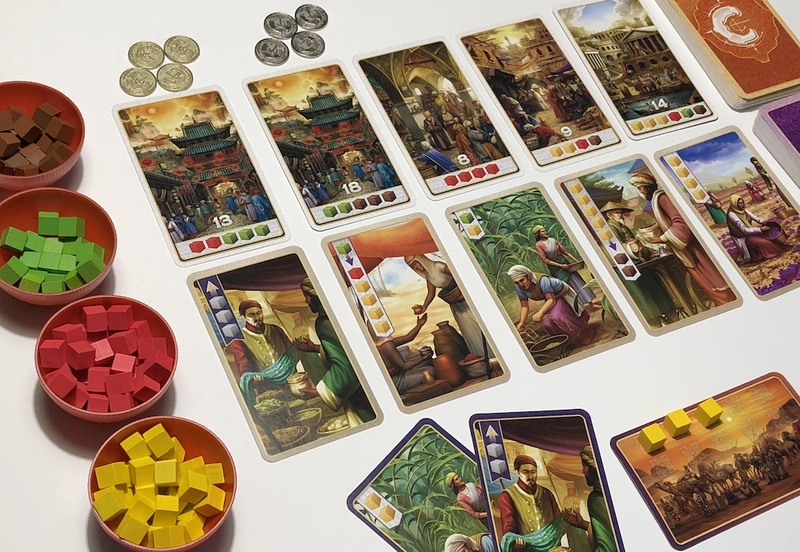 Century: Spice Road was designed by Emerson Matsuuchi with artwork by Fernanda Suárez and is published by Plan B Games. 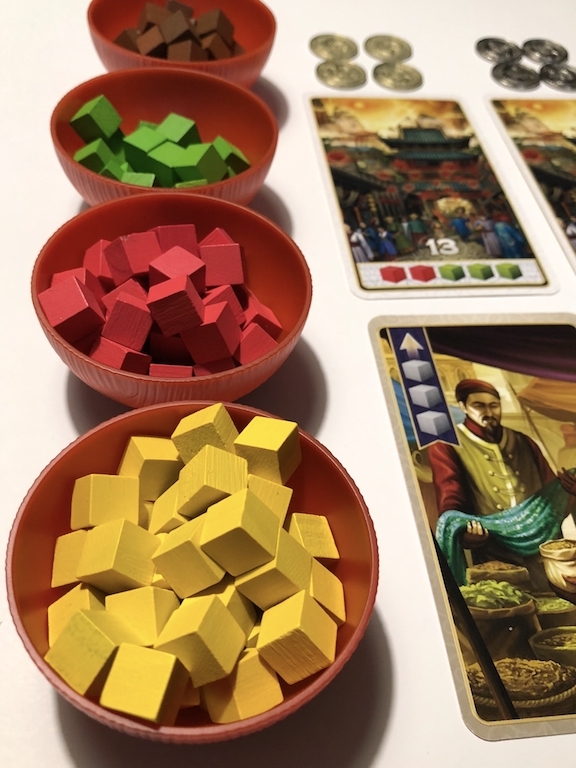 The game is for 2-5 traders and incorporates engaging mechanics including: drafting merchant cards, spice pool management, and hand management. Place spice cubes by type (cinnamon, cardamom, saffron and turmeric) into the included bowls. Shuffle points cards and deal 5 five face up in a row, and create piles of gold and silver tokens above the leftmost points cards. Deal two starting Merchant cards to each player, and shuffle the rest, drawing 5 to create a row next to the deck. Give each player a caravan card; the player with first player symbol goes first. Give each player their starting spices, and you’re ready to play. On a player’s turn, they may take one of four actions: Acquire, Play, Rest, or Claim. Acquiring a Merchant card will provide the player with a critical play action: (take) Spice, Trade, or Upgrade. Acquiring can come at a cost (hey, not all merchants will work for free). Taking a Merchant card requires the player to place a spice on all cards to the left of it in the row. This means the leftmost merchant card is always free. Any spices left on prior players’ turns are also taken as a bonus. Shift all the Merchant cards to the left and add a new card on the right of the row. A player manipulates their spice pool by playing a Merchant card from their hand. 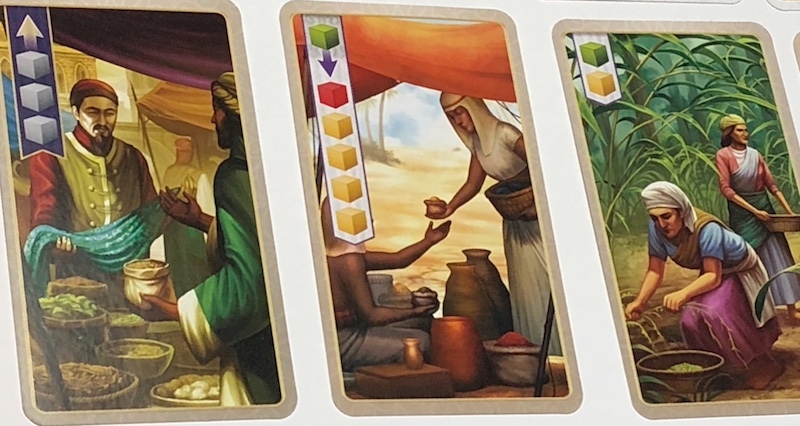 A Spice card allows the player to take the indicated spices from the bowls and place into their caravan. An Upgrade card allows the player to trade up for more expensive spices. For example: two turmeric cubes can be upgraded to two saffron, or one turmeric can be upgraded twice – first to saffron, and then to cardamom. This is a quick way to get more valuable spices required to claim point cards. Trading allows the player exchange a specific set of spices for a specific result. The image above shows a Trade card that allows a player to exchange one cardamom (green) to receive one saffron (red) and four turmeric (yellow). Rest allows the player to collect all used cards back into hand for use again on a future turn. When resting, nothing else may be done on this turn. To Claim a point card, the player must have all the required spices shown on the card. Spice cubes are returned to bowls and the card is collected. If the leftmost point card is taken, take a gold token from the pile. Gain a silver token when acquiring a card from the second card slot. Once a card is claimed, the row slides left, and a new card is revealed on the right. When a player acquires their fifth point card (sixth in a 2-3 player game), the end is near. Players finish the round, then tally up their points cards. Each gold coin adds 3 points, and each silver coin adds 1. The player with the most points wins. Century is a deceptively simple game, yet the decisions are very in-depth. Tension continuously ratchets up as strategies shift in response to actions taken by other players. Pay attention to your opponents’ spice pools and try to anticipate what cards they might be vying for. Use this knowledge to scoop up high point value cards before they do. Gold and silver tokens affect decision timing a lot. Do you acquire a lower value point card just to get the token, or hold out for a higher value card down the line? Claiming a good mix of point cards will get you further too. It’s a delicate balancing act as strategies can change quickly. Merchant cards are alluring but should be selected carefully. Collecting too many merchant cards can waste upgrade and trading actions. While it might look the silver bullet, it’s not always the case. A normal game lasts about 30-45 minutes, although two player games run shorter. Century: Spice Road can be taught in less than 3-4 minutes. After a few turns, players will catch on to the mechanics and flow of the game. Century is an excellent gateway game to introduce new players to the hobby. It is simple enough for new players yet challenging for seasoned ones. Replayability is extremely high. Century’s theme is dead on. The game’s mechanics and gameplay truly transport you into the role of a traveling spice merchant seeking wealth and notoriety. The attention to detail is astonishing! The cardstock is thick and cube size is just right, but the spice bowls steal the show. They enhance the overall thematic table presence, but also serve a very basic purpose keeping the table organized and neat. Oh wait, one last thing! 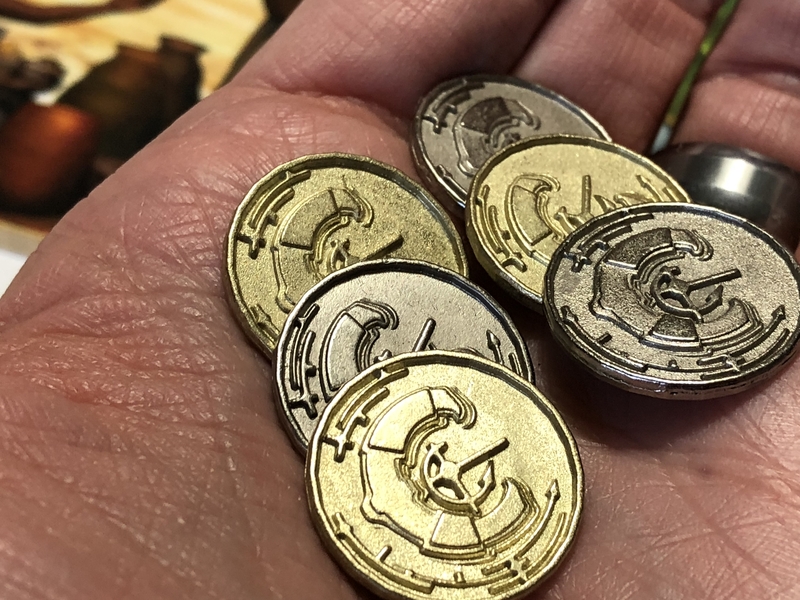 Did I mention that the tokens are metal? 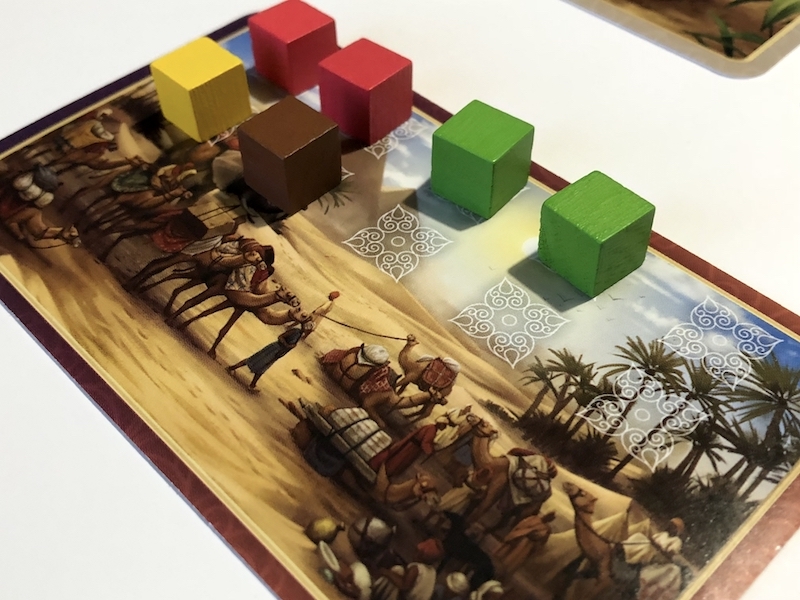 Century: Spice Road was one of my favorite games of 2017. Everyone I taught it to immediately wanted to play again. I love that it’s friendly to all types of gamers. Strategic approaches between players will be completely different each game. Player interaction can vary as well depending on your style. Do you go it alone or try to read your competition and thwart their plans? I don’t think you could do anything to make it better. In my opinion, Century: Spice Road is a must own. You can acquire it at your friendly local game store or on Amazon. For around $40, you’ll get an amazing game that will be a shelf staple for years to come. Great review! I really appreciated the detail put into this, and it gives a great overview of how to play the game, as well as your impressions. Looking forward to reading more from you!